I love to bake, but I’m not a professional. In fact, I’ve only recently started to play around with fondant and gum paste as a hobby. I make little things for potlucks in my office, and a coworker got wind that I was also starting to play with “decorating cakes,” instead of just cupcakes and quiches. I was so flattered that she asked, because the cake was for her 50th birthday, and that’s no tiny event! It’s also the first cake I would make for someone who requested one from me, and my first large tiered cake. I gave her a list of all the cake flavors I could do, as well as fillings, and she decided on a three-tiered cake: first tier (10-in.) 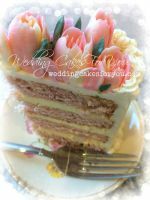 yellow cake with strawberry mousse, second tier (8-in.) just plain yellow cake, and third tier (6-in) lemon cake with raspberry mousse. The icing was Italian meringue buttercream. She also wanted red and gold decorations and “some kind of ribbon.” Since it’s summer, I decided to go for flowers and butterflies. 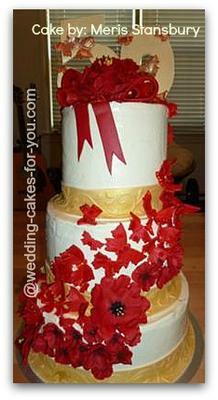 The gold ribbon is an ivory fondant ribbon (pre-made) and sprayed edible gold. 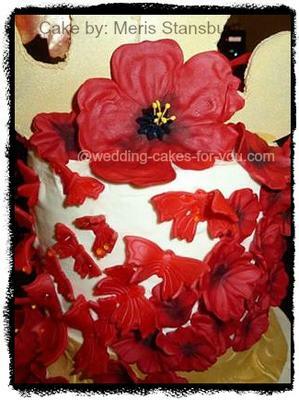 The butterflies are Fondarific’s red buttercream fondant, and the flowers are Satin Ice’s gum paste tinted red. The actual ‘50’ is foam core, sprayed edible gold. That, and the flower stamens, are the only non-edible parts. I started by looking at pics online and getting inspiration. 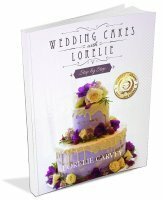 Let me say this now: every cake recipe and icing recipe I use is from Wedding Cakes for You. These are the best cakes I’ve ever made, and not just because they’re good for tiers! The Italian meringue buttercream is also some of the lightest, tastiest and easiest I’ve ever made. Decorations were designed by brainstorming. I went to my favorite place to buy decorations, Global Sugar Art and browsed all the categories during my lunch hours. Just by browsing I got the idea for the edible sugar crystals on the butterflies, and found my butterfly cutters, the edible spray gold, the pre-made ribbon, etc. Then came the support. 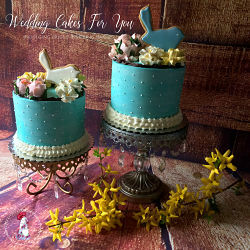 I was browsing Wedding Cakes for You when I read about cake stands and support systems. Brilliant! I ordered a three-piece special price set from Cake Stackers because the last thing I wanted was a wobbly, lopsided cake! I decided to use Wedding Cakes for You’s suggested time frame for making your own wedding cake with a few tweaks. The cake was for Saturday, so a week prior (Saturday before deadline) I began making all of my cake decorations with gum paste and fondant. Monday night I put the finishing touches on these decorations. Tuesday night I baked and froze my cakes. Wednesday night I had to re-bake some cakes and then freeze. Thursday night I made the mousse fillings and crumb coated, and I took Friday off work to put the final icing coat on the cakes, assemble them on the cake stackers and put them in the fridge. Saturday I applied all the decorations and my coworker came to pick up the cake in the evening. If it were only as simple as that! To start, I must have incorrectly measured some cake ingredients because the lemon cakes came out terribly. (I was making 1 10-in, 2 8-in, and 2 6-in cakes). I was also so tired that at 2 a.m., and having to get up the next morning for work at 5:30 a.m., I stuck an 8-in vanilla in the freezer without letting it cool. So Wednesday night, I baked my lemon cakes and one vanilla cake again, letting them cool completely this time, and they came out perfectly. Crisis #1 averted. Next, I tried to make my mousses but the consistency was too runny--I ended up doubling the whipping cream amounts provided on this site and then refrigerating before using. But after filling and freezing the cakes, I realized I had forgotten to use buttercream dams! So I had to let them sit out, then take out some mousse, then make some buttercream, and then dam and re-freeze. Crisis #2 averted. Then I tried to crumb coat and realized I didn’t have enough butter to make more buttercream to continue crumb-coating the top lemon tier. Ugh. Off to the grocery store at 10 p.m. This is also where I got hit by a car in the parking lot as a woman who was texting was also reversing full-speed. Strangely enough, the butter I was carrying absorbed the impact (got smashed in the process), and I was fine except for some minor hip bruising, but it did mean I had to go back and buy more butter! Crisis #3-4 averted. Next, when I tried to stack my cakes on the cake stackers, the cakes were too firm from being in the fridge and wouldn’t slide down the supports. So after spending 2 hours putting the final icings on my cakes, I had to press down on the tops of the cakes and ruin the icing to get the cakes to slide down evenly on the metal supports. Time to re-ice the cakes! Crisis #5 averted. The next crisis happened because my apt. is so small I can’t open the fridge door completely because the oven is in the way (yes, the kitchen is that small). So after spending an hour jamming the oven to a new angle and re-arranging my fridge shelving, I put the cake in the fridge, only to have a bowl of jello from the top fridge rack, fall from the rack in the back space and onto my cake—jello, bowl and all. Oh man. Time to re-ice the cake…again. Crisis #6 averted. 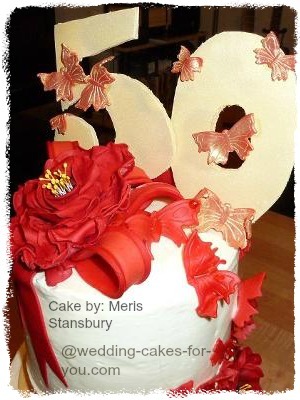 Then the ‘50’ decoration I had originally made from hardened and dried fondant cracked and broke. Thank goodness I had some left-over foam core from a presentation. Crisis #7 averted. Finally, I had to figure out how to get the buttercream from melting during the trip from my apt. to my coworker’s car in 100-degree weather. The answer: walk quickly and use arm strength you never thought you had. Crisis # 8 semi-averted. There are tons of tips, but here’s the one that’s the most important: get some sleep. Half of my problems stemmed from not paying attention because I was rushing and tired: miscalculating cake ingredients, forgetting important steps, not thinking logically (hard cakes will not go easily onto metal supports; hard, thick fondant will crack if not structurally sound; hot cakes in the freezer will be soggy when defrosted), and letting cakes get bombarded by jello bombs. So, please, BE RESTED! Start planning how much flour, sugar, butter, vanilla extract, etc., you need way in advance if you’re making a tiered cake. A calculator is useful…as is a boyfriend who’s good with math and can tell you how many feet of pre-made fondant ribbon you need to wrap your cakes’ circumferences. Edible gold spray cans are tinier than their picture. If you’re going to spray a lot of decorations, get 2-3 cans at least! Save up your money—designing cakes is not for the frugal. Americolor gel colors are the best, because they will not run after hours and hours. Get a cake turntable—it’s worth the investment for how easy it is to ice your cakes. Put your fondant and gum paste decorations in airtight containers. This way, they’ll keep for weeks, and up to months. Be careful with your fondant and gum paste decorations. If you press too hard on them once dry, they will crack and break. And finally—be FEARLESS. Everything seems daunting when you’ve had no formal training, but as long as you have the will…and lots of supplies…there’s a way. And don’t be upset if things don’t work out exactly as you planned (I could never get Michelle’s rose-peonies to look like she did—my petals wouldn’t ruffle like hers), just improvise and have fun. It will all work out in the end! If I can do it, so can you! So in conclusion to this epic, my co-worker had a wonderful party and a wonderful cake for her many, many guests. I didn’t charge her, as this was the first cake I had ever made for someone (I used some savings to buy everything) but it was worth it, just to know that: A. I can do it! And B. I made someone happy! The best of luck to you. And I do hope that you will full fill your dreams of baking and decorating cakes full time someday in the near future. You have the drive and the natural talent. I'm so happy that you tried the Cake Stackers too. Tell all of your friends and family about your post and hopefully between them and all of my readers you will get comments and ratings. By the way I featured your testimonial and your cake post on the home page. It deserves to be seen. I don't even like cake. But this one looks too good NOT to devour. Amazingness squared! Meris, you are one very talented, rare, determined and dedicated individual, and I am very proud to know you! 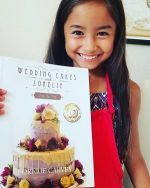 You ROCK girl, and if I am ever in need of a cake for a special occasion,(Merianne's wedding comes to mind) I'll be sure to hire your services! Love you! Good luck and many blessings in the future! Best cake I've ever soon. People would think you've been doing this for years! The mishaps just make for a better story. The cake is incredible! You missed your calling Girl!! You made an amazing cake! This online editor thing should be for play and the cake decorating your main business. You have the guts and skill to make it happen. I have had your cupcakes and they are very delightful and delicious so I know the cake was awesome. Keep up the great work! Forget the editing thing. Bake full time! Meris, You should forget being an editor and bake full time! It's a beautiful cake! The intricacy really takes this cake to a whole new level...what a phenomenal achievement for someone so new to decorating. I am sending a comment a second time because my first one was under anonymous, since I thought the name was optional,and I just discovered that anonymous comments cannot be accepted. It is truly an amazing cake! I do not think a professionally trained pastry chef could have done any better. 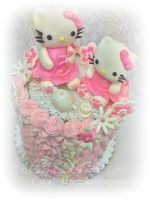 The three tiers are perfect, the flowers, butterflies and ribbon really flow together beautifully and the cakes and mousse sound delicious. You created a masterpiece! I also love your story, very entertaining. 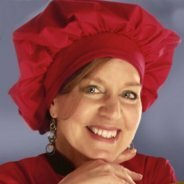 The tips you gave are very helpful and I love the fact you are ready to admit that baking and decorating such a beautiful cake is not all that easy. But you did it! You are determined, you are talented and it certainly shows. The sky is the limit !! So you'll make my cake when I marry Leo yes? Great job, Mervis. I hope you've starting thinking of hilarious baking puns/literary allusions for your future bakery name (I took the liberty of getting you started with my comment title), and that you've picked out a funky retro pink and black outfit for your future appearance on Cupcake Wars, because I'm pretty sure you're not allowed on that show without a funky retro pink and black outfit. I am the PROUD recipient of this gorgeous cake. Not only was the cake decorated beautifully the cake was amazingly delicious. All my dinner guest loved the cake...some even said it was better than dinner. Meris keep on baking it's your calling. Outrageously beautiful and a fine example of the skill, craft and dedication necessary to complete such a fine piece of culinary magnificence. Bocuse, I apologize if there was a glitch with the comment form. An outstanding creation that exhibits creativity, skill and dedication. I know the work she put into this cake is beyond description. A fabulous creation. Ton gateau es tout simplement magnifique. Tu as beaucoup de merite et surtout de courage pour l'avoir terminé malgré les soucis que tu as rencontré!!! tu es une vraie pro!! This cake looks wonderful and the story is wonderful as well!! I think it is gorgeous in many many ways, and it even fits the style of decorating I love. My only critique is that the top tier seems proportionally a bit too large compared to the rest of the cake, but I guess it may just be the camera angles that make it look that way. Anyway, its gorgeous, and I love that it offers so many unique flavors! I have to agree with everyone else, your cake is so beautiful ! What is amazing is that this was your first tier cake and that your kitchen is so tiny. I can only imagine what you would do in a large kitchen. Your story is so funny, you have a great sense of humor.Also I think your decorations are incredible. Never give up baking, you are so gifted ! !